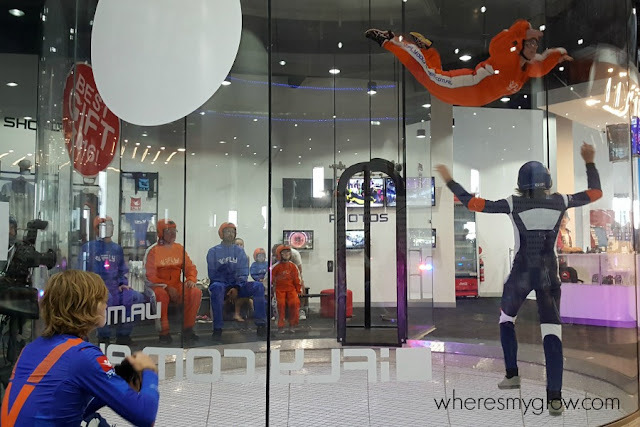 I got to head to the launch of indoor skydiving facility iFly Perth this month and I spent most of the evening with my jaw hanging wide open in disbelief. I am now in the background of hundreds of photos looking like I'm catching flies. Attractive! I was so awed by the set up and the performances of the skydivers (and they really were performances!) that I squealed and clapped like a kid at her very first circus. I couldn't quite believe what I was seeing. I was going to call it ballet in the air, but the speed these professionals were flying it looked more akin to those 'wheel of death' motorcycle cages sans the motorbikes. In. Sane. I came away from the party feeling pumped, and wondered if just watching others do it was so good, how extreme would it feel after I had a go? 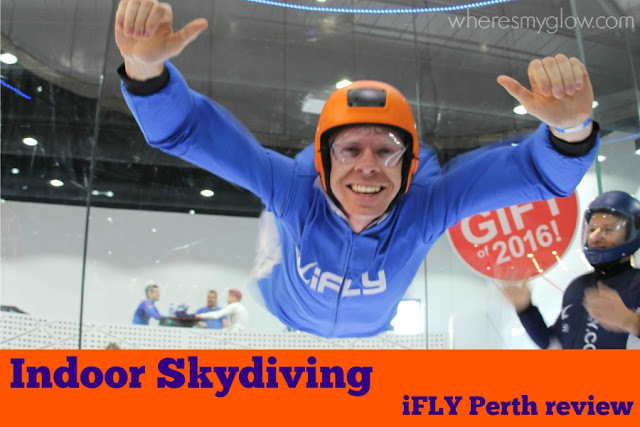 So yesterday MapGuy and I headed to the brand spankin' new iFly Perth to find out. 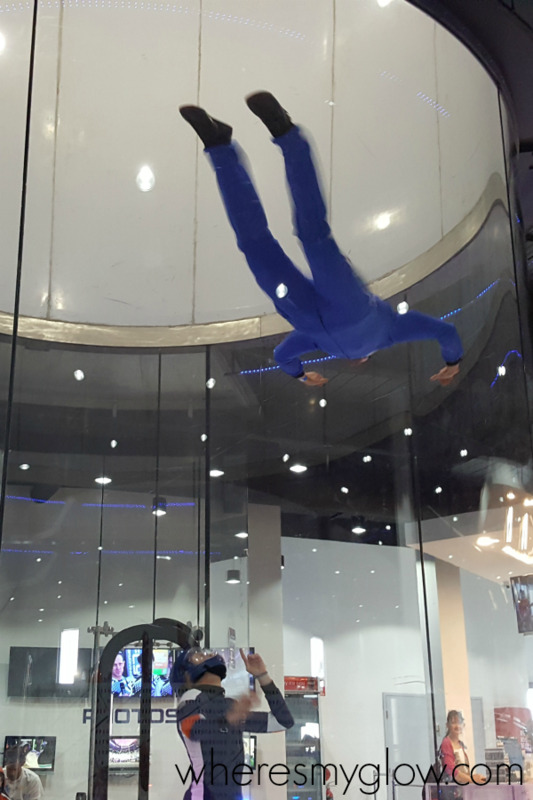 I can tell you, our first taste of indoor skydiving did not disappoint! We suited up (almost attractive as my slack jawed stare on opening night) and had our introductory lesson from our instructor Danny, a highly experienced skydiver with around 520 jumps to his name. We learned how to hold our bodies, the hand signals used (you can't hear anything in the tunnel), and all the safety details. Then it was go time. Do you think orange is my colour? There were six of us in our group ranging in age from three to mid fifties. Yeah, that wasn't a typo. One of my fellow students was a toddler. 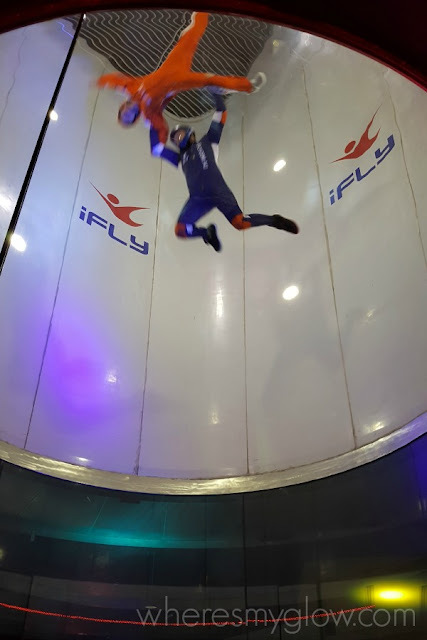 Because the speed of the wind in the tunnel is controlled in real time by another skydiver, it doesn't matter how big or small you are. Plus the instructor in with you has a level of fitness up there with elite athletes so they can help everyone from littlies to big burly blokes, all while being blasted with air. The feeling was so completely foreign that I had to work hard to concentrate on following Danny's hand signals, and I had no idea if I was putting my legs in the right spot or not because I couldn't really feel where they were, but his thumbs up said I was doing OK.
We each got two flights, the second of which was better because that unknown element was gone and I felt I could follow instructions better. I can see my house from up here! The wind blasting up my nostrils was a bloody weird sensation. 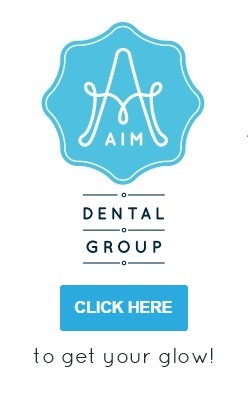 They could legitimately add "complimentary sinus clean" to the list of services they offer. There really was no down side to the experience. It's short, and there are options to go for longer, but the general time is the same as what you'd get with a freefall from 14,000 feet. Then you just pop out, let someone else have a turn and you're up again. 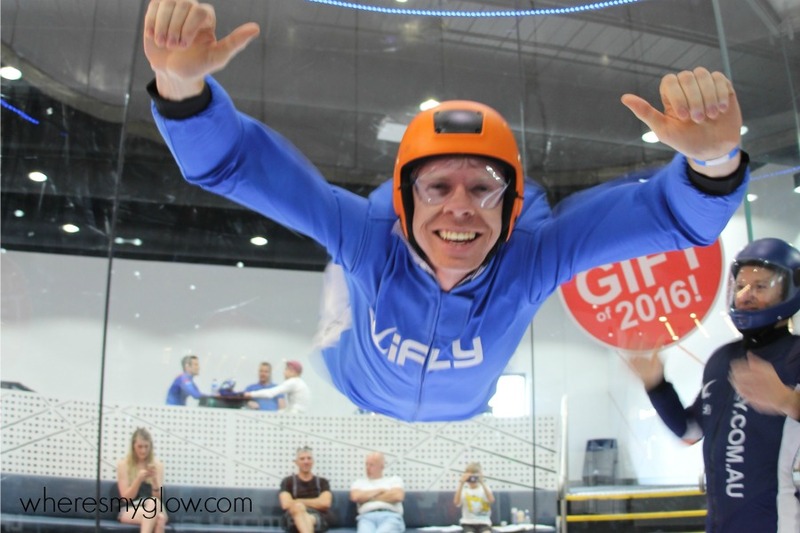 No flight, no ear pressure worries, no parachute worries! It's so controlled and it on top of actually being very safe, it felt safe - I wasn't scared at all, and at no time did I feel like I was about to drop out of the sky. I don't know yet if it has made me want to jump out of a real plane, but I definitely want to go back and have another go. Even Tricky says he wants to have a go, so I've promised he can go for his birthday next year. If you're stuck for a present, a voucher for experiences is always great, but indoor skydiving is just next level awesome. 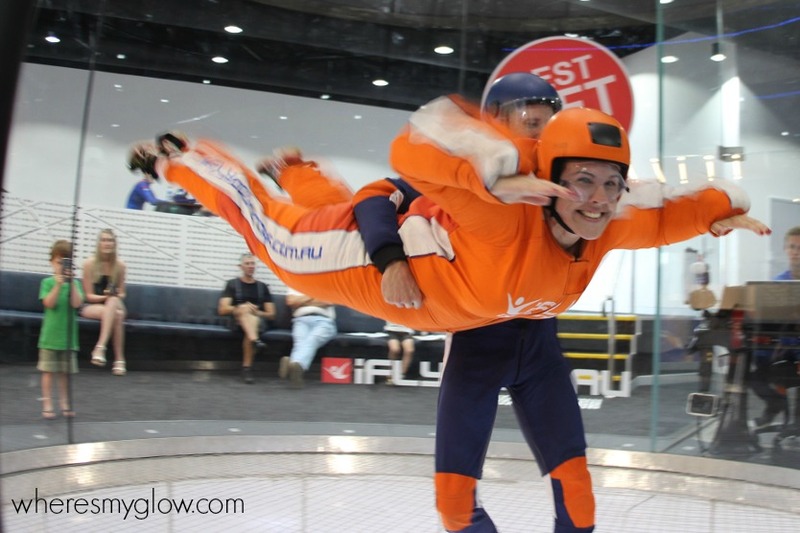 iFly has locations in Sydney, the Gold Coast and Perth, and prices start at a very reasonable $89.